Karen Swanson of New England Design Works Designed this Pennville Kitchen for her own home, and it won not only the regional Sub-Zero award, but also the National Kitchen & Bath Association's medium kitchen of the year. Karen is located in Manchester, MA and can be reached at nedesignworks@gmail.com or 978.500.1096. Sanity saver. Storing muffin tins, pans and racks upright makes so much more sense than stacking them one on top of the other. It’s not rocket science, but it does make you wonder why every kitchen doesn’t have drawers like these. 94. 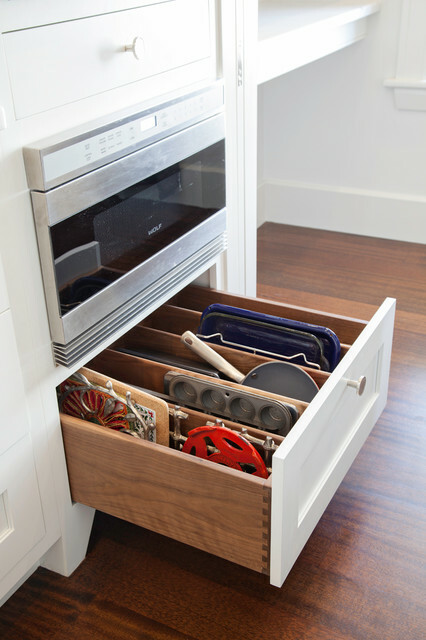 Tailor your drawersHere’s another idea for maxing drawer capacity – perfect under-oven practicality. Sorted! Interesting but I'd prefer a drawer for pot lids. Definitely need a divider for such items but would like them to be higher up in a cupboard. Only drawers or pull out shelves under the counters.